Overlooking the classically beautiful Mediterranean, *Lion Resorts Vacation Club - Capital Coast Resort and Spa* offers hospitality and relaxation to every guest it hosts. Close to the Tombs of the Kings, the Paphos location offers not only stunning scenery but proximity to a fair amount of historical sites of interest as well. The resort itself is modern in style, and features a large outdoor pool and pool bar, a restaurant, a wellness and spa facility, evening entertainment and on-site shopping. 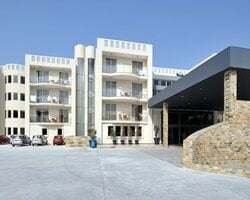 For more information about this charming Cypriot resort, visit www.lionresorts.com. Annual floating week! Close to the beach! Dining nearby! Buyer May Receive A Title Fee Credit, Inquire For Details!